In addition to our 4 annual exhibits held in our on-site George V. Deneff Gallery, Arts & Services for Disabled, Inc coordinates an additional 4-6 community exhibits each year in various venues across the greater LA area. Many of our community exhibits are made possible by on-going partnerships with organizations such as UCLA National Arts & Disability Center, REMO Drums Inc, Long Beach Health Department, Getty Center…etc. This extensive and growing exhibits programming fosters professionalism, visibility, accessibly, and community connections for all artists with disabilities. Artbeat for Humanity (ABH) is a unique partnership between Arts & Services for the Disabled, Inc. and Remo, Inc. ABH provides opportunities for artists with disabilities to utilize the drum not only as an instrument of rhythmic expression, but also as a canvas to share their creative expression through artistic channels. Each year dozens of drumheads are transformed into truly inspired works of art and are exhibited at their dedicated gallery space at the Remo Recreational Music Center in North Hollywood, as well as other professional venues. 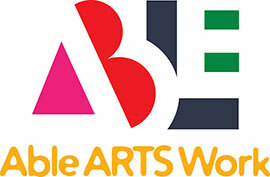 CORE is a collaborative project by Arts & Services for Disabled, Inc. and the National Arts and Disability Center of UCLA. In its 6th year, CORE continues to extend its reach to artists nationally and worldwide. The exhibit showcases artwork, literature, and performances by artists with disabilities with the purpose of providing a space for artists, community members, and arts and disability advocates to build common bonds and promote visibility through a diverse art forum. The Long Beach Health Department has dedicated its upstairs walls as a community exhibiting space for ASD artists since 1990. Each summer an intern through the Getty Center Multicultural Undergraduate Internship program is responsible for conceptualizing and installing a new body of work by artists of Arts & Services for Disabled, Inc. This non-traditional exhibit venue serves as an essential bridge for our artists to show their work in an environment that reaches a large # of community members.